It’s the Tuesday night before Christmas as UCLA Luskin professor Ian W. Holloway tucks his 2-year-old daughter Sofía into bed and prepares to leave his home on a tree-lined street of bungalow-style houses in the Larchmont neighborhood of Los Angeles. It’s time for Holloway, an assistant professor in the Department of Social Welfare, to get back to work. Along with three UCLA student researchers, Holloway will spend the next several hours in West Hollywood doing legwork for his latest research project. Their task will be to find and interview gay and bisexual men outside popular nightspots and discover how much they know about an ongoing meningitis outbreak and the steps that health officials have taken to battle it. This type of time-consuming, on-the-ground research is par for the course for Holloway, who serves as the director of the UCLA Luskin-based Southern California HIV/AIDS Policy Research Center and is currently juggling four major research efforts related to his expertise in health disparities among sexual and gender minority populations. Holloway’s dedication and his innovative methods recently led the Society of Social Work Research (SSWR) to select him for its Deborah K. Padgett Early Career Achievement Award, presented in January 2017 during the organization’s national conference in New Orleans. On this night, however, the meningitis study takes precedence. Outside the Urth Caffé, Holloway helps the student researchers establish a “line” — in this case basically a crevice in the sidewalk — at the corner of Melrose Avenue and Westmount Drive. 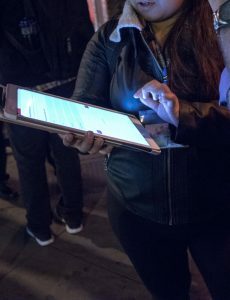 One or more of the students then approaches any man who crosses that line, asking them to participate in the research effort by spending 20 minutes answering survey questions using an iPad. In the first half-hour, however, only one man who meets the study’s criteria has been successfully interviewed. Holloway and his research team are trying to complete about 500 interviews for the project by February, and foot traffic is just too light to continue at the site. 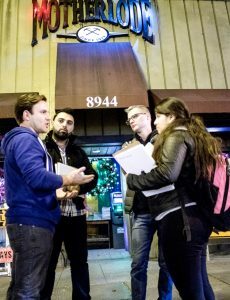 So they move on to the next venue that has been randomly preselected for this night’s canvassing effort — the Motherlode, a tavern with removable walls that proudly shows off its dive-bar atmosphere to passersby along Santa Monica Boulevard. 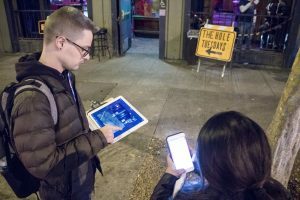 The thought of an academic research project centered around bar hopping in West Hollywood until 2 a.m. may seem incongruous, but it’s a proven research approach that works particularly well when the target audience is gay and bisexual men in Los Angeles County, including those who are HIV positive. During a meningitis outbreak that has led to two deaths in Southern California since it was first reported last spring, the researchers need to go where those who are most at risk can reliably be found. Holloway’s meningitis study is funded as part of a four-year, $4-million grant from the California HIV/AIDS Research Program to produce “what we call rapid response research,” he says. 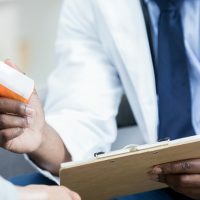 The idea is to complete research within months, not years, related to timely policy issues that impact people living with HIV or AIDS in California. 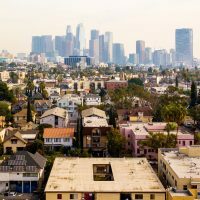 As noted on its website, CHPRC.org, the center works closely with community partners from AIDS Project Los Angeles Health and the Los Angeles LGBT Center to tailor research efforts to match urgent needs within the LGBTQ communities. “We get community input, synthesize that and then set an agenda for policy research,” Holloway explains. 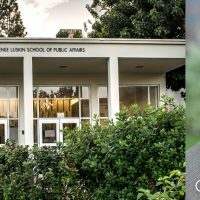 He took over the center’s leadership last April from Arleen Leibowitz, professor emeritus of public policy at UCLA Luskin, and feels fortunate to conduct research efforts that directly arise from community interaction. 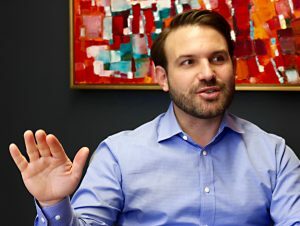 The meningitis study resulted from a meeting in October at which about 40-50 advocates, health workers and social service providers from across Southern California came to Los Angeles to talk about the needs of people in the local LGBTQ communities. “These are people who are working with HIV-positive clients, who are doing prevention work,” Holloway says of the attendees. The meeting gave them an opportunity to think about and debate the issues most affecting their communities. 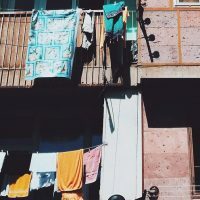 The researchers primarily were there to listen and help structure projects that could be completed in a rapid response timeframe to produce data that would actually benefit those communities. “It is … very much aligned with the mission of Luskin and the mission of the Department of Social Welfare,” Holloway notes. Back in West Hollywood, the Motherlode proves unworkable as a survey venue on this night. A private party is booked at the site, but it won’t start for a couple of hours and the survey team can’t afford to simply bide time waiting. Holloway, ever cheerful no matter the hurdle he faces, quickly gathers his team to discuss their options. Proceed to the next pre-selected venue? 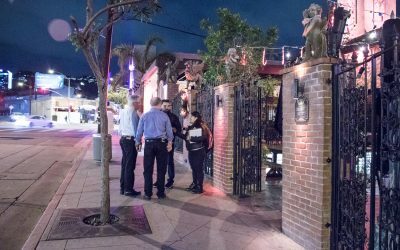 Or go just around the corner to the “emergency backup” site, the Abbey, a 25-year-old West Hollywood landmark that has been voted the best gay bar in the world. Within minutes, the team is in place outside the Abbey, and all three student researchers are actively engaged in recruiting potential survey respondents. To gather enough surveys to produce statistically valid results by their deadline, Holloway has put together a rotating team of about 10 UCLA student workers, assisted occasionally by a couple of alumni who help out during staffing shortfalls. The majority are current Luskin master of social welfare students, but two are in a Ph.D. program. The data being gathered now will be analyzed by March to inform a research brief that should help California produce better outreach and better programs centered around meningitis vaccination for this population. The student workers collecting the information were carefully screened during a selection process led by Holloway’s research manager, Elizabeth Wu. “We are looking for people who are obviously outgoing and who understand the importance of collecting good quality data,” says Holloway, whose own affable manner permeates the research effort. 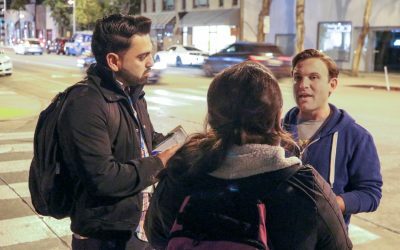 The canvassers, who refer to Holloway mostly by his first name, also need to be comfortable staying out to the wee hours to chat with strangers they encounter outside bars and clubs. For researcher Christine Munoz, a first-year MSW student who got her undergraduate degree at UC Riverside, the learning process was frenetic at first, but also rewarding. The survey teams have been on the job since November, gathering data that Holloway says will either confirm or refute the notions that helped form the basis of the survey hypothesis. Without a systematic infrastructure in place to promote the wellbeing of these men, health officials often find themselves in a defensive posture when dealing with outbreaks of vaccine-preventable illnesses among HIV-positive men or men at high risk for HIV. “It shouldn’t take an outbreak for us to realize this is a priority community,” Holloway says. His passion to understand and promote better health options for LGBTQ communities is an outgrowth of Holloway’s life experience. He was raised in Northern California during the early years of the HIV crisis in America. His parents’ generation saw an entire community of gay men decimated, almost wiped out by AIDS. A two-year study supported by a $1.89-million grant from the U.S. Department of Defense is looking at the experiences of of lesbian, gay, bisexual and transgender active-duty service members since the 2010 repeal of “don’t ask, don’t tell,” the law barring homosexuals from openly serving in the military. A study funded by the NIH through a small research grant mechanism uses predictive technologies to understand how gay and bisexual men use geo-social networking apps and other kinds of social media to find substance use partners and sexual partners. 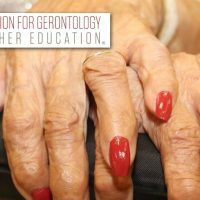 This collaborative effort with UCLA’s departments of engineering and computer science is using predictive algorithms and social media data to try to understand how social media behavior predicts health behavior. And he is involved in the development of a social networking app for HIV-positive black men in L.A. County in the 18-29 age range through a grant from California HIV/AIDS Research Program. It will be a virtual community space where these men can connect with those with similar experiences, focusing not just on health and medication adherence but on housing, job assistance, social services and/or legal needs. Despite his prolific research output, Holloway doesn’t neglect his classroom responsibilities. If fact, he finds that his research interests often dovetail nicely with teaching opportunities. Out on the streets of West Hollywood, student researchers such as Ryan Dougherty are learning first-hand how much knowledge exists among today’s gay and bisexual men about the serious health issues that still impact many of them. As a student in the social welfare Ph.D. program at UCLA Luskin, Dougherty may follow in Holloway’s footsteps someday, pursuing research of his own that will benefit marginalized populations and ameliorate health disparities. At the Abbey, those logistical barriers are in full force as Dougherty attempts to stop men who cross his survey line outside the venue’s patio-style entrance. Some ignore him. A few politely wave him off. One is willing to take the survey but doesn’t qualify because he is not a resident of L.A. County. Soon, however, a young man in a white hooded sweatshirt approaches. Dougherty catches his attention. The newcomer meets the research criteria. And he is willing to take the survey.